on windows 7. at one point the gui opened and i actually saw emulation in a window of an errored disk, i foolishly tried to update gtk2+ thinking it would fix things (when all i did wrong was not set the ROM...) and i can't even get the sheepshavergui to open now. Restore your Windows OS to a earlier restore point before the mess was created. The restore feature helped me at times when I did not exactly recall what "improvements" I had made. As things are working again, be sure to create a restore point of your own. 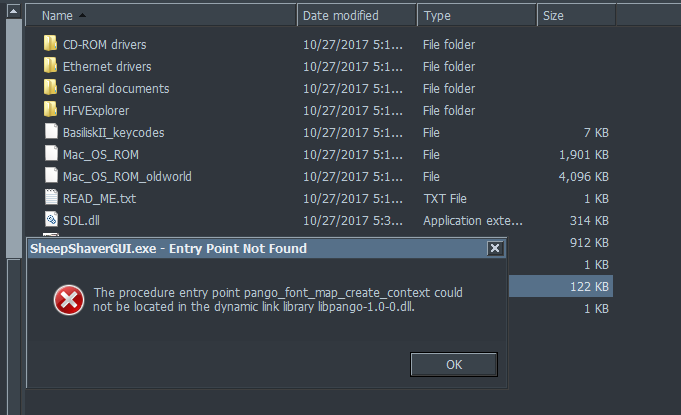 Please check your environment variables for both your user and system for GTK entries and path entries.